Outdoor Living Rooms are the perfect solution for busy modern lifestyles, where there is little time or inclination for gardening. Even for the more green-fingered among you, gardens are undoubtedly used for more of the year when an area is set up as an outdoor room. 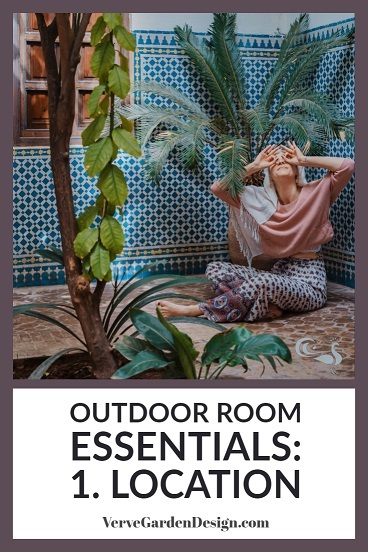 Read on to find out the key elements of an outdoor room and how to start planning one at home. In a tiny city garden, your outdoor room will likely take up the whole space. However, in mid-sized suburban and country gardens, there may be space for a few different zones in your garden. Since the outdoor room is likely to become the most well-used area, it is important to situate it carefully. An obvious option is near to the house, so you can easily pop inside every time you want a top-up or some more food from the fridge. It is usually also less expensive to run utilities such as electricity and water from closer to the house. Sometimes though, other areas might be more desirable locations. For example, if you will use the room mostly in the evenings you will probably want it where you can catch the evening sun. If you will use it in the heat of the day, you might want it in a shadier location. You might also want your outdoor room in an area where it is next to a nice view, or hidden more from the neighbours. Taking time to think about the best location will pay dividends in the long run. Just like in an indoor room, an outdoor room needs a defined area to feel comfortable and homely. Since you will have a dining table or comfy seating, an outdoor room really needs a solid floor structure. A patio with a properly-laid sub-base is the longest-lasting solution. There are endless possibilities for stone, concrete or porcelain paving to link the outdoor room to the colours of your home and surrounding area. Decks are also very popular and can also last a long time if properly maintained or if good quality composite decking is used. Just make sure that the joists used to hold up the deck are strong enough to take the weight of your chosen furniture. Also bear in mind that constantly moving chairs etc. can scratch the floor area, so choose wisely. A good finish on the floor area will set the tone for your outdoor room. You will never get the feel of a modern indoor room with a threadbare 1950's floral carpet, so start with the right foundation to make the rest of your outdoor room feel cohesive. However, if your budget won't run to a new deck or patio, there are some fabulous outdoor rugs around that will make a real difference. Or try a stencil and paint a tile-like pattern on your existing concrete slabs using an appropriate primer and concrete paint. For oodles of inspiration, check out our Pinterest Board "The Garden Floor: Paving and Decking". As well as defining the floor area, an outdoor space will feel more like a room if it has a sense of enclosure. One of the best ways to achieve this is with a pergola. We explain why in our blog "How To Make Your Garden Feel More Intimate With a Pergola" and you will see types for all budgets on our "Pergola" Pinterest Board. If you are short on space, a lean-to pergola attached to the house is a good option. Another option is to position your outdoor room next to a garden boundary so that at least one side has a solid backdrop. Fences and trellis can easily be given a room-like feel with some paint. You can now ask your local DIY store to mix up almost any colour imaginable using an outdoor paint base, so no need to stick to boring brown or British Racing Green! We love smokey dark greys, as explained in our post "12 Small Garden Design Ideas To Take Away From RHS Chelsea 2018". Dark purple Copper Beech hedges give a contemporary look and the russet leaves stay on in winter giving added interest for those Bonfire Night and other midwinter festivities. You could also try a yew hedge or even a large garden tree in a more traditional or country-style setting. Just make sure that you are not going to be bombarded by apples or nuts when sitting peacefully underneath! Lighting might seem like a luxury in an outdoor room but it adds so much in extending the time that you will use the space. Once you have gone to the effort of creating a stylish outdoor area it really will become an extension of the home and draw you outdoors more. Lighting is not just functional i.e. letting you see in the dark and making sure that you don't trip after a few glasses of wine. One of the main purposes of lighting in an outdoor living room is to create ambience, much the same as indoors. Unlike lighting your driveway, or the path to your front door where bright lights are the order of the day, softer lighting is needed to create mood. An inexpensive option is to use candles if you really don't need much light. The flickering effect can be romantic and mesmerising but we recommend placing them in large lantern holders as the slightest breeze can leave you blinded. We learned that lesson one New Year's Eve when virtually all of the 40 tealights in jam jars we had lovingly placed were blown out in five minutes. It sounds boring I know, but keep safety in mind when kids are around candles or if you have a party of revellers. For temporary use, an alternative is string lights with an extension cable plugged into the house or garage, but this can be a trip hazard and needs to be brought in each evening. If your budget runs to outdoor underground cabling then permanent lights are the most practical in an outdoor room. You can light the floor through decking or paving, use uplighters in nearby trees or add an outdoor chandelier or chic outdoor standard lamp. If your outdoor room is multipurpose with cooking, dining and lounging sections, you can vary the lighting to delineate in each zone. Don't Miss Our Weekly Posts. Sign Up For Our Newsletter! If you have seen our post "8 Reasons Why a Firepit Will Make You Use Your Garden More Often", you will know how much we recommend including some warmth into your outdoor room. Unless you live in the tropics there will be times that getting chilly will be the main reason for heading indoors. Like lighting, we find that heat is a major driver for people using their outdoor rooms longer into the night and for more months of the year. While some lovely blankets will create instant hygge, nothing is more welcoming and atmospheric than a real fire. A Kadai firebowl or brick/stone/metal firepit are great for open flames. A chiminea is ideal on a less-sheltered site as the flames are more contained. A few companies are making outdoor wood burning stoves, while fully built-in outdoor fireplaces make tremendous focal points if in your price range. Gas firepits are an option too, using piped natural gas or LPG bottles. The electric and gas patio heaters popular in street bars a decade ago are probably the least efficient way of heating your outdoor room and so are much less popular these days. Make sure that however you warm the space, you do it safely. You would be amazed how many people end up with scorch marks on decks! If you want to linger outdoors your choice of furniture will make a big impact. Hard metal seats may look lovely but they are not very comfortable for lounging. Outdoor rooms are meant for wiling away time outside and so well designed chairs, sofas and dining chairs are pretty much an essential. If you want to re-use your existing seats and benches, add some cushions and blankets to make them more relaxing. Try to store cushions near the outdoor room though (or even better within built- in seating) or else you will be more reluctant to go and fetch them. It is also well worth considering other types of seating and we love swing seats, rocking adirondack chairs and giant outdoor bean bags. Don’t forget to have plenty of small tables near seats for drinks and nibbles- even painted pallets can be used for this so no need to break the budget. We do recommend investing in a sturdy dining table though, since meals in an outdoor room tend to be longer affairs with friends and family. Materials that withstand all weathers with minimal maintenance are ideal. Outdoor rooms need a defined cooking area. Image: Verve Garden Design. One of the real pleasures of an outdoor room is cooking and eating all in one place. It is so much more sociable when everyone stays together and even participates in preparing and cooking the meal. I really enjoy preparing food outside, even if it is a simple salad of home grown vegetables and herbs. For cooking, you can incorporate anything from the simplest barbecue right up to an all-mod-cons outdoor kitchen. Just building a brick or block surround for the BBQ and adding some worktop space really helps extend the preparation area. However, if you will cook and entertain outdoors regularly, you might also want some fridge and storage space and a sink is tremendously useful. Our Pinterest Boards “Outdoor Kitchen” and “Pizza Oven” have some great ideas for layouts and styles for all budgets. Consider adding storage to your outdoor room. Image: Verve Garden Design. While it might sound trivial, you quickly get fed up trekking in and out of the house for things when you are enjoying some relaxing time outside. If you have the space, therefore, storage can be really useful. In true room style, why not add a wooden sideboard or shelving unit? Make them out of your decking for a cohesive look. Shelves can be made for logs under fireplaces, tables and barbecues and even whole boundaries furnished with logs can look fantastic. In small spaces, doubling up functions of garden elements is the key to success. Storage can be built into benches and coffee tables to save space. Sheves and cupboards can be incorporated into pergolas too. It is amazing what a project between you and your local carpenter can come up with. Or discover the pleasure of crafting something yourself! Modern outdoor rooms need a specific style. Image: Verve Garden Design. No matter what your budget or the amount of effort you can put into creating your outdoor room, sticking to one style is the key to success. It could be Colourful Mediterranean, Country Cottage, French Rustic, Urban Minimalist, Boho Eclectic, Californian Chic or anything that suits your style and that of your home. However, think twice before you follow your latest holiday to Bali or Brighton for inspiration- in my experience people tire of garden fads quickly and it is better to plan for longevity given the investment required. Don't worry if you are unsure of how to choose a style, our post "How To Choose A Modern Garden Style" will help you out! You know that we love Pinterest for finding and collecting ideas. Why not create a Pinterest Board for your project? Spend plenty of time making a moodboard for your ideas until you feel happy with your choices. In case you are wondering, we are no affiliated with Pinterest in any way- but we haven't yet found a better, free tool for planning a garden project :). Finishing touches add detail to an outdoor room. Image: Verve Garden Design. Indoor rooms with only wallpaper, flooring and light bulbs would feel pretty soul-less. A few restrained finishing touches will also make all the difference to your outdoor room. Add some small pots of herbs, flowers or succulents or pick some flowers and pop them in a vase. Choose light fittings, cushions and perhaps a tablecover that match your chosen style. Add a few candles and some nice table-wear. Use a large pot as an ice bucket to keep your drinks cool. You could even add a large clock or outdoor picture. It is often these final details that make your efforts extra special. 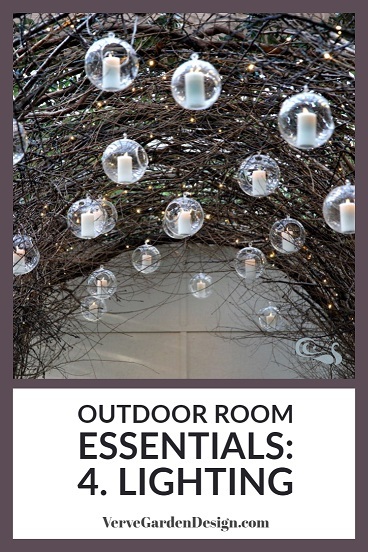 Inspired To Make Your Own Outdoor Room? We hope so! Leave us a comment with your preferred style.